They think it's all over - it is now! Ronnie O'Sullivan is the 2012 World Snooker Champion after potting his way to a 18-11 win over Ali Carter. Resuming 10-7 ahead overnight, Rocket Ronnie never looked in danger of surrendering the lead and pocketed a 141 break - the highest in the history of the Final. 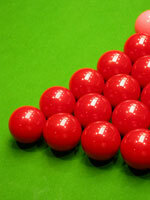 Ronnie was also the oldest winner, at 36, since Ray Reardon in 1978. Carter did manage three frames in a row during the afternoon session, but it only helped in reducing the deficit, rather than put him in control of this final. After the match, Ronnie was joined by his son and told everyone he will probably take a six month break because of the new 50 week tour organized by chairman Barry Hearn. He said he will retire unless the 'right people' stop trying to 'blackmail the players'.